Sign up at the Yoga Tribe Website or give the front desk a call at 714-968-9642. The true yogin is a Master of everything in his or her own life. To be a Master of your own Self is to fully understand who you really are and integrate all components of your humanness. Self-Mastery via the Eight Yogic Disciplines as outlined in the Yoga Sutras. The Eight Limb Path is the Master Key to understanding the system of yoga. In this workshop you'll develop skills and acquire tools that will guide you into boldly being of service for your yourself, community and your business/family life. 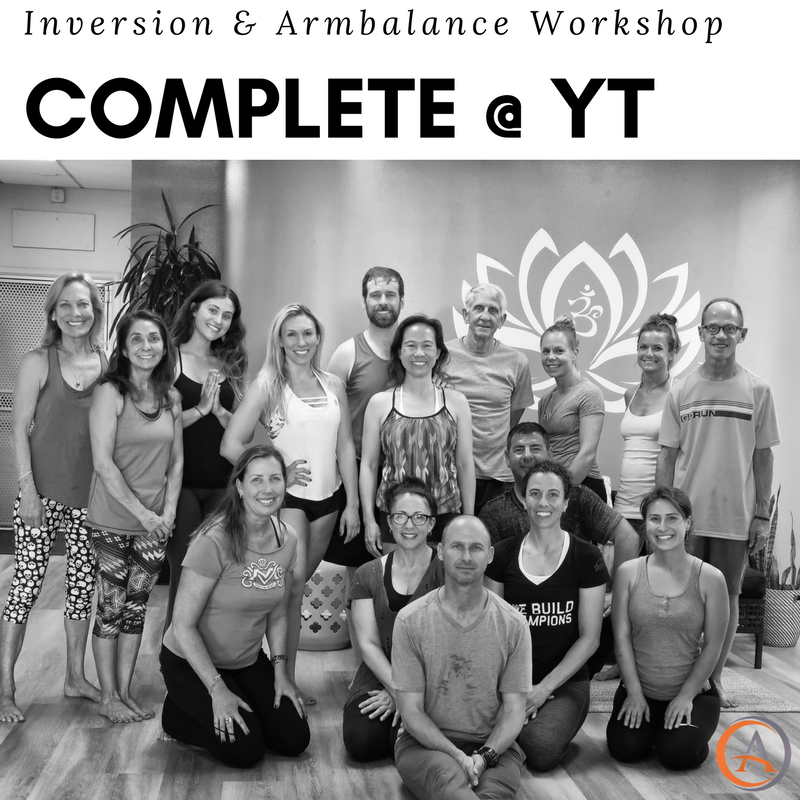 We will tie it all together by discussing/analyzing the Authentic Leadership Model to drive the point that yoga is a complete system of personal development that has real world impacts. Bring a note to jot this down and gear to practice in. Christian has been teaching at Yoga Tribe since February of 2018 and teaching full-time since 2011. He is a Baptiste Yoga trained teacher, 20-year Veteran of the U.S. Coast Guard, holds an MBA in Strategic Leadership from Dominican University of California and current graduate student at Loyola Marymount University working toward an MA in yoga studies. He lives in Huntington Beach, CA. I will be teaching this powerful workshop again. Yoga is the oldest form of personal development. The sutras are powerful guidelines to get present to the power of the Tapas. 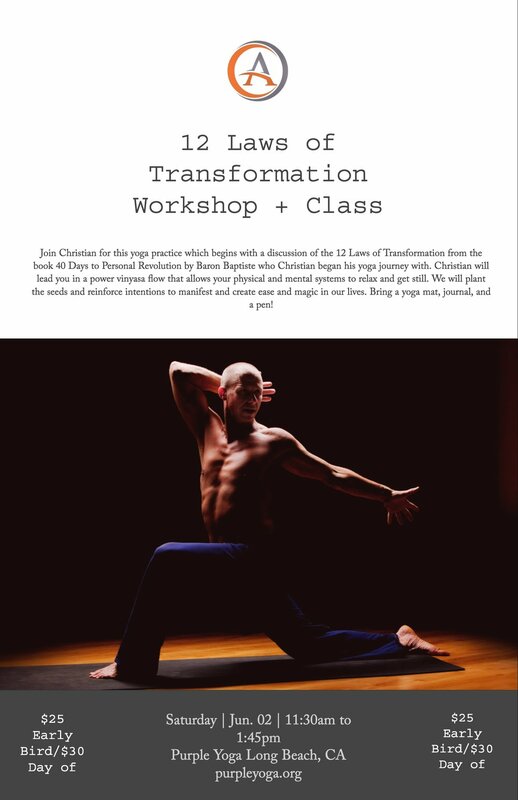 Join Christian for this yoga practice which begins with a discussion of the 12 Laws of Transformation from the book 40 Days to Personal Revolution by Baron Baptiste who Christian began his yoga journey with. Christian will lead you in a power vinyasa flow that allows your physical and mental systems to relax and get still. We will plant the seeds and reinforce intentions to manifest and create ease and magic in our lives. Bring a yoga mat, journal, and a pen! The true yogi is a Master of everything in his or her own life. To be a master of your own self is to fully understand who you really are and integrate all components of your humanness. Without a dedicated practice, there can be no Self-Mastery. Yogins already practicing asana have taken the first step toward Self-Mastery, now it's time to learn the methodology behind self-mastery via the Eight Yogic disciplines as outlined in the Yoga Sutras. The Eight Limbs are the Master Key to understanding the system of yoga. In this workshop, you'll develop skills and acquire tools that will guide you into boldly being of service for your yourself, community and your business/family life. point that yoga is a complete system of personal development that has real-world impacts. Loyola Marymount University working toward an MA in yoga studies. SIGN UP HERE! CLICK HERE!